It was another hot Saturday today, but at least the humidity was about half of what it was last weekend. The bees were much calmer today which makes me think they didn’t like the hot sticky weather last weekend anymore than I did. The girls had sucked the feeder dry for the second week in a row. 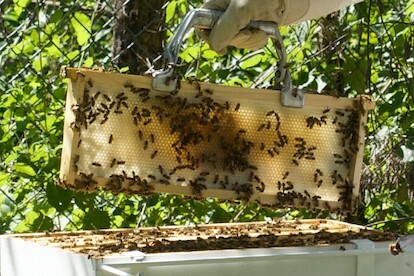 I had planned on checking the syrup level mid-week, but it rained all week which ruled out opening the hive. I think the weather is rain free for the near future so I’ll hopefully be able to check the feeder at least once before next week’s full inspection. On the plus side, I really think feeding the bees is helping out in the wax production department. 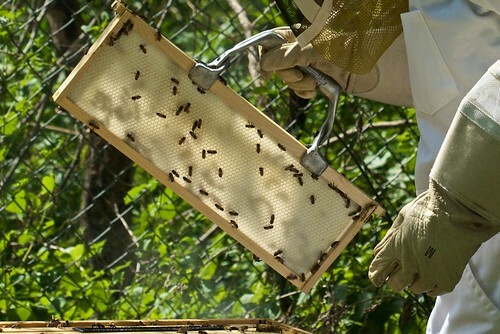 I was pleased to see comb on the previously empty frames, and in the case of the photo below, they are even able to raise brood in small section. It’s not 100% fully drawn, but I’ll take progress at this point. I wish I had started feeding in early July, but hindsight is 20/20. I also got an extra treat of seeing Large Marge in the 2nd super. I even managed to get some video with my iPhone that I’ll post later. Everything else was business as usual. I’m still finding small hive beetles, but I have yet to find any evidence of comb destruction (knock on wood) so the girls are keeping them in check. All in all, a good inspection and a healthy hive. 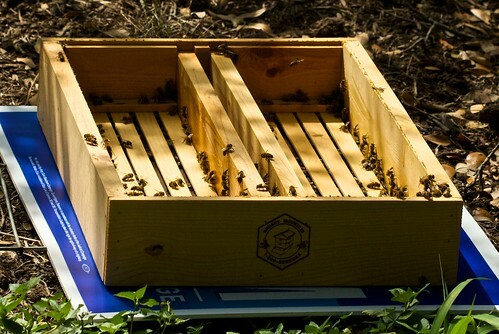 For any Austin area folks who are beekeepers or interested in beekeeping, tomorrow is the monthly Urban Beekeeping Meetup at Emerald City Press. It starts at 2:00pm and usually lasts a few hours depend on how many people show up. One thing we have an abundance of here in Austin in the summer is plenty of sunshine and hot days. After my two honey harvests, I had a bunch of unprocessed wax sitting in the freezer, and what better way to get it melted down than to use the power of the Texas sun (which is actually bigger than anywhere else in the world). There are plenty of plans on making a solar wax melter out on the internets, but they seemed a lot more complicated than I wanted to deal with. Luckily, Linda’s Bee Blog had a suggestion for those living in the hot southern climates of the U.S. which is to simply use a cheap styrofoam cooler with a piece of clear glass on top to melt your wax. Beeswax melts at around 145 degrees and with average daily temps between 95 and 100, it doesn’t take a lot to get an enclosed space hot enough to melt your wax. So here is a quick video I put together today to walk you through the process. It is not very professional, but since I got an iPhone 4 the other day, I figured I might as well take some video of the hive before I opened it and got the girls all worked up. Be sure to listen for the chickens in the background at the end. If you recall from last week, I decided to add the top hive feeder back onto the hive to hopefully supply the necessary artificial nectar flow to encourage the colony to build out more comb in the empty 3rd super. When I removed the inner cover, the girls had totally used every last drop of the syrup. However, after performing my hive inspection, it appeared they used most of the syrup to fill out the comb in the 4th and 5th honey supers on the frames I had previously harvested honey from and added back to the hive. It did appear that some work had gone on building out comb in the 3rd super, but not really enough to use for brood. This was not what I wanted to see. Of course I didn’t have the foresight to bring out more syrup because I really thought one batch would do the job. Now it looks like I’ll be making up another gallon to add back on tomorrow which will hopefully do the job. Earlier this week, someone broke into the Hayes Valley Farm and sprayed pesticide into 3 thriving hives. Two were completely destroyed and one loss 60-70% of its population. Unfortunately, we live in an environment where bees are exposed to all sorts of pesticides that have now become a given in modern agriculture, but I can’t believe someone would intentionally want to destroy these hives especially after all the media around the current plight of the honey bee. I found this very amusing.